A java based interactive software sky atlas. 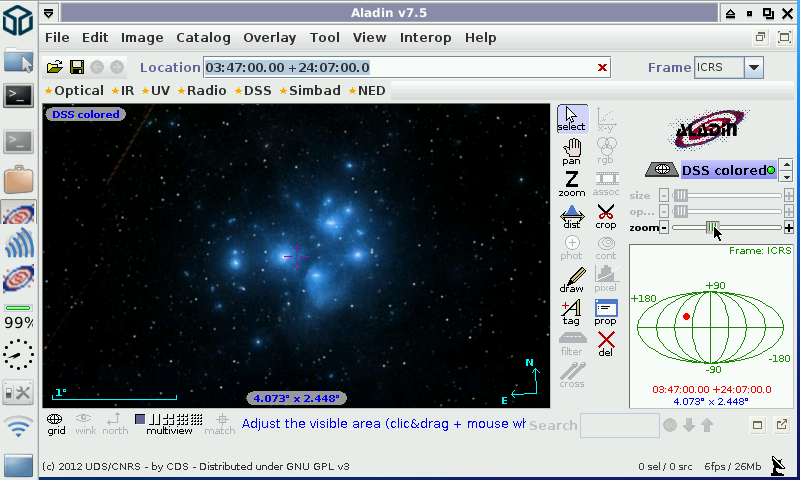 Aladin is a java based interactive software sky atlas allowing the user to visualize digitized astronomical images, superimpose entries from astronomical catalogues or databases, and interactively access related data and information from the Simbad database, the VizieR service and other archives for all known sources in the field. 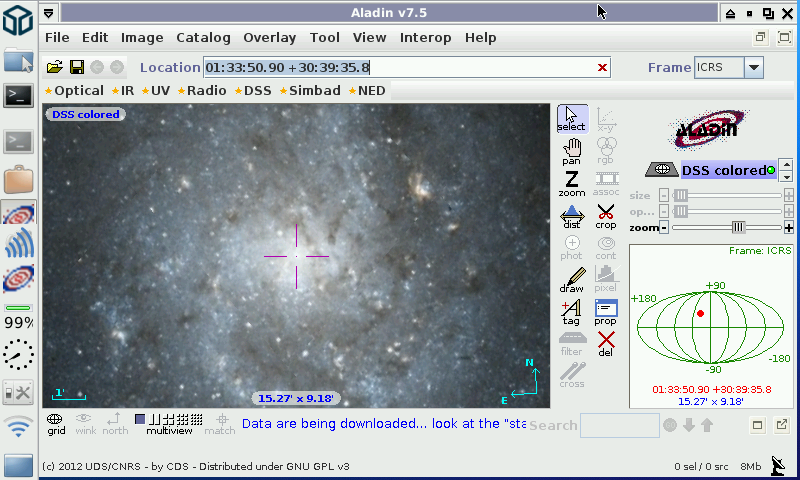 In simple terms, Aladin is the armchair astronomers delight! Explore the night sky, overlaying literally millions of available images ("do" astronomy any time of the day or night - without getting cold) - or conduct "more useful" research with this powerful tool. Aladin is a massively capable application - and I really cannot do it justice in these few words. For more information, please visit the website! Quick start: type A Messier object reference, coloquial name, other database reference or position in the Location field (the images shown below are for M33 and Seven Sisters), hit return on your keyboard and off you go. Astronomy without getting cold! It was grayed out in the File menu ... probably I had to select the layer in the list on the right (not sure what I did, but at some point it worked fine). Thanks! Images save fine. The save prompt is down and to the right of the screen. Try autohiding you taskbar. This is a pre-compiled jar file, so I cant change dialogue positions. The resources are also used by professional Astronomers. Seems that I can't save any images though, am I doing something wrong or is this feature missing? Would be usefull to directly grab .FITS files from this. The image or the main window?